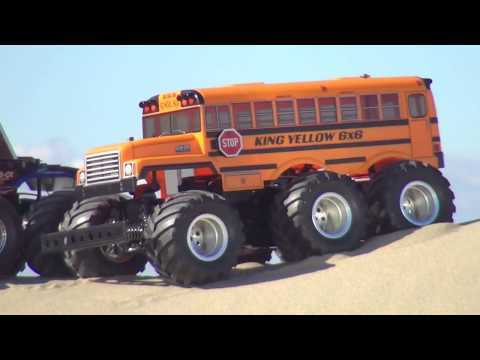 The Tamiya 1/18 R/C 'KING YELLOW' 6x6 Off Road School Bus Model Kit. Tamiya's newest big-wheeled 6WD model - the KING YELLOW 6x6! This model utilizes a new geardriven 6WD chassis which used the GF-01 as a starting point. The excellent drive it provides will make for supremely fun off-road driving. The 6WD chassis employs 3 differential gears to transmit power from the front-centre-mounted motor to all of the model's wheels. These differentials are encased in the durable monocoque. 6-wheel independent double-wishbone suspension is paired with friction dampers. The brand new polycarbonate body was inspired by a classic american School Bus, giving it a true 'Old School' feel. The kit manual build creates a front wheel-steering model. It also includes instructions to re-assemble it into a 4-Wheel Steering model with steerable rear wheels. Separately-sold 4WS function transmitter and R/C equipment are required. The model is compatible with many GF-01 chassis Hop Up Option and spare parts. Its powerful gear-driven setup allows the King Yellow to take on slopes of up to 40 degrees -the perfect outdoor drive all riding on massive deep rim wheels. Please note that this kit requires additional items to function. We have packaged the radio control system, battery and charger together for an easy additional purchase.